After you updated MotoG2 or Moto g3 to marshmallow from Lollipop, you may opt to downgrade marshmallow 6.0 to 5.1.1 Lollipop. Several android users are complaining about the problems after marshmallow update. Such users include the users of Moto G2 , Moto G3, Samsung Galaxy S6 , Lenovo K3 or K4 note and A7000 clients. They want to change marshmallow to lollipop in motog2 or motog3. This guide will help you to downgrade marshmallow update to Lollipop 5.1.1 on your motog2/motog3/ Lenovo K3 note and LG or Lenovo series A7000. It is very easy to upgrade to marshmallow, however to remove the updates, It’s quite difficult. 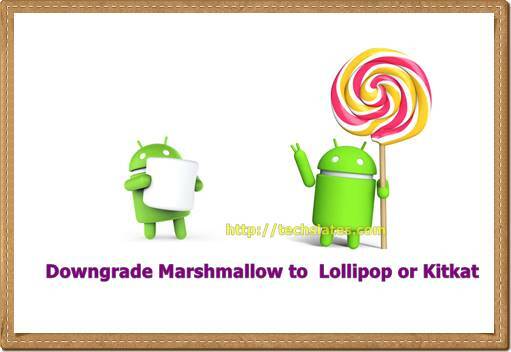 Officially, there is no way to downgrade android version marshmallow to Lollipop or kitkat. However, I have come across several articles over the internet to help you uninstall android 6.0 to Lollipop 5.1.1. Try the below guides to remove the marshmallow 6.0 update. You can degrade android 6.0 to Lollipop 5.1.1 with rooting motog2 or motog3 or Google Nexus device. Google releases new android version with security patches and upgraded kernel. Yet, after installing marshmallow, several problems like wifi problems, battery draining and heating issues, apps freezing problem. Before you try to downgrade Android 6.0 to Lollipop 5.1.1, check if you can fix marshmallow battery drain issues. If you are facing Wifi Mac issues after the android version update, try this fix MotoG Wifi problems guide. Several Google Nexus 5/6 or Nexus 9 gadgets are having the marshmallow update problems. Nexus 5 or 6 or 9 users might have updated to marshmallow from kitkat or Lollipop 5.1.1. If you want to downgrade marshmallow to kitkat 4.4.4, follow this guide on nexus 5/6 or 9 gadgets. Nexus users can follow this guide to downgrade Android marshmallow 6.0 to Lollipop 5.1.1 without any issues. If you are moto g2/g3 or moto E2 user, you might be having battery issues after the marshmallow update. Several moto G users face such heating and battery drain problems. Recently, the network signal problem in moto G2/G3 users is rampant. Such android users can move from marshmallow 6.0 to Lollipop using this android article . Currently, Moto Series users cannot downgrade to Kitkat 4.4.4 from marshmallow update. If you have upgraded samsung galaxy s6 to marshmallow and wishing to downgrade it to Lollipop 5.1.1 using this downgrade steps. The procedure is same with Samsung Galaxy S6 Edge too. For LG Users: LG G3 or G4 users can also re-install lollipop or kitkat. LG G3 users is advised to follow this method and LG G4 users can downgrade marshmallow update using this guide. There is no rooting method to move to Lollipop or Kitkat from marshmallow on Lenovo A7000. I will update the downgrade steps once they become available. It is not recommended to downgrade your android version from marshmallow. Several android gurus suggest that the process to move down the android version in the hierarchy is complex and very dangerous.The process include several critical steps. The gadget might get bricked during the downgrade process. Proceed at your own risk to downgrade your Moto G2/G3 or Nexus and LG series phones. If you face any problems, in how to downgrade marshmallow to Lollipop or Kitkat , write to us in comments.